Home » Managers » STATE GOVT. JOBS » Tamilnadu » Trainee » Tamilnadu Newsprint and Papers Limited (TNPL) Announced for Managers and Trainee Posts. 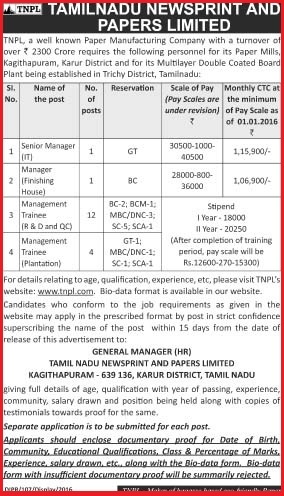 Tamilnadu Newsprint and Papers Limited (TNPL) Announced for Managers and Trainee Posts.